She Should Contest is an advocacy campaign project supported by Oxfam Nigeria which seeks to motivate women to run for political offices and encourage wider society to support women’s politics participation. At the heart of the campaign is a desire to use social media and video messages to change attitudes and perception about women in leadership by getting more women to believe in themselves and helping society see that half of the nation’s human capital is made up of women and many of the skills and experiences that women posses are tied to leadership characteristics and traits which could be very useful in developing the nation’s economic resources. She Should Contest project will be implemented in phases. There is a general saying that most elite people do not actively participate and engage in political processes. 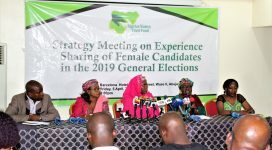 This phase of the project will target elite individuals and focus on creating a buzz and awareness around the benefits and possibilities which come with women in leadership positions in Nigeria by spurring more online discussions about women’s involvement in politics and decision – making, mobilizing more support for female candidates while also providing motivation for female politicians. She Should Contest will also collate data on female representation at the state executive structures which will be used as a baseline in our advocacy engagement after the 2015 elections. This research will cover the 36 states of Nigeria.